This week we met a family who had fled their home and sought refuge with relatives. Not an unusual story in Gaza, perhaps. However this was a Palestinian family from Yarmouk refugee camp in Damascus. The mother of the family is originally from Gaza. Her three sons have never been here before in their lives. Their father is still trapped in Syria. The eldest son, 17 year-old Ahmed is bright, sincere and softly spoken. Listening to his accounts of the situation in Syria was staggering. During this conflict I have found it difficult to comprehend the brutal reality faced by the Syrian people. It still is, but meeting Ahmed has brought it home to a much greater extent. He showed us a video clip he'd filmed in the immediate aftermath of a government missile strike on a mosque in a residential neighbourhood. Over 200 people had been killed, some of his friends amongst them. He hadn't posted the video online while he was still in Syria for fear of reprisal. Meanwhile, a friend from Germany whose trip to Gaza had been delayed, instead went to the refugee camps on the Turkish-Syrian border. From there she went into north-western Syria, to the region around the city of Idlib. What follows is her eyewitness account. While i search to find my way through the dark into a borrowed pyjama in the sleeping room of a family I don't get to know because they fled the bombing i stumble over a left behind bottle of deodorant. "Freedom spray" it says. Quickly i spray a little puff onto me and offer the others too. We are in Maarrat Al-Numan, a city in Syria in the close range of Idlib. The city used to have about 120.000 inhabitants, now the people remaining –we will never get the exact number. The estimations vary from 2000 to about ten thousand. People keep leaving in fear and keep coming back when there is hope that it has become safer. The city is now split in two halves. The ‘free side’ we get to know is that of a constant hide out. But freedom is there, since the people lost the fears of the regime, they tell us. The frontline of fighting between the army of Assad and the ‘dshesh horr’, the free army runs through it. You need to know which streets to walk, you don’t just take a chat at the wrong corner. Snipers can shoot very far. We get asked if we want to visit the ‘Jabbha’, the front and we reject. The question feels strange, because we are already close to about one kilometer to it, the constant barrage of bombs and shooting becomes our usual surrounding very fast. We reject as we don’t see the need to go. Neither are we journalists hunting a story, nor do we feel can we achieve any ease to the situation by going there. We are not on an adventure trip and even if our feelings with the resistance grow day by day, sharing the ditches men in arms lye in is not our mission. But we understand the need of the people wanting us to know all of their story. And that of the resistance at the front understandingly is part of it. We stubbornly stick to our decision that we will not go further and this is respected by all we meet. The shelling that has been inflicted on this city is so intense and the destruction we witness so massive, that searching a comparison i can only find comparisons in the images and stories I know of German cities in 1945. But the massive difference here is this society did not start or lead a war. The life, that is crawling through the cracks is also similar to the stories I've heard of those times. You'll see a little chimney popping out of the ground somewhere, the only sign that there is people underneath. Windows of half crushed houses covered to not let the little bit of light through that those inside have managed to organize for themselves. Mainly what we see is just dead and silent. The only sounds we hear is those of the continuity of bombs dropping. It's become a ghost city. We walk streets and corners of destruction, never knowing when the next bomb drops close or far. When you do meet people, everybody greets each other intensely and also the good byes are of a kind that has a different depth than when you usually meet at a street corner. One day we will be passing a building and returning a few hours later find it crushed completely. Two of the young men we had met there in the morning were hit by the crush and were now evacuated with heavy injuries to Turkey. There is quite a lot of cats around and the people remaining have built a strong relationship with them. One will tell us that he has now 27 cats he is feeding –because it makes him sad that they too have nothing left to eat. Another who is a photographer collecting the images of his city being killed has a little collection of happiness in his photo files that he shows me: the cats of his city in various moments and places. People tell us about the story of a cat hit by the Assad army and that they gave surgery for her in one of their field hospitals. We have come here with a group called “hopeful smile”. They have always been here, also before the revolution started. They are just a group of people of this city who have always tried to do nice stuff. They show us pictures of their activities of before –pictures where we can also see the city of before and the life there used to be. Street cleaning actions within the neighborhood, like giving aid, toys or times of fun to families in need, maybe a little summer camp or such. At least this way we get to remember them not only as survivors of the horror, but also as the other people they are. Through their eyes and stories we can know this city has once been different. This ‘before the revolution’ and ‘after it succeeds’ is the all surrounding frame of the stories of now. When the things developed as they did, from the first demonstrations to the complete destruction we are finding now the people of “the hopeful smile” decided to stay. They still don’t carry guns. They know their people, they know the area and they know what they need to do. They are finding the families in hiding, they search them everywhere in every crack and every cellar, in the holes in the mountains and under the ruins of ancient cities built 4000 years ago. They find the needs and try to cover them. İt’s an almost impossible task, they themselves have to organize the aid from an outside that is hard to reach and feed the hundreds of people they find in the various shelters. İt is everything people need: food, water, blankets, clothes, plastic sheets to protect from the rain, a doctor and a smile. “the hopeful smile” are a group of young men who are also everybody from this city of before: a doctor, a student, an engineer, a teacher, a teenager who used to go to school or somebody who used to have a little shop. We go out with them to deliver and we are very impressed by the correctness of their work in this big mess. When the search crew has located a family they will first take the exact data. Who are they, how many, which age and as such, what is their need and what can their ration of the few things there are consist of. There are ready packed bags of food, that can feed a family for a few days. There are big packs made of a big plastik sheet serving as a make shift roof, in it wrapped you will find a matrass, a few rubber boots, socks and two or three blankets. They carry with them a few bags stuffed with clothes they collected and search the exact fit out of these bags when they find people too poorly dressed to withstand the cold. All of it is documented and when things are unclear they are solved first before the aid goes anywhere. İt is hand delivery only, this sole correctness hard to keep up when the rules of need and greed take over in the isolation this society has found itself in. From people we hear that whole truck loads of aid are stolen by thieves. But then it is hard to understand again. In many cases of course there is a main criminal intent behind the robbery, but in some it might be the decision to steal from the big agencies who are neglecting the people inside and take care that the aid reaches there. A logical understanding tells me that the resistance of course wants to feed it fighters. The other logical understanding in me knows that this situation creates powers, where only the strong ones have the methods to decide. The “hopeful smile” stick to their methods of correctness and sit over long exel files, countless photos and videos they make to prove this. The aid they receive is paid by themselves or by few donors like friends of theirs in exile. With them we crawl into little caves in the hillsides. İn a cave we will find 10, 20, sometimes thirty people hiding from the bombs that drop on their cities. We travel to the ancient ruins of a byzantine city, once a tourist attraction or a place to have a picnic, the ruins and the aqueducts underneath have now become a shelter for many more families. These are families from a farming community called Faruma that has been hit by the shelling of the regime. As people they have already lost their homes and quite some family members, but as farmers they are determined to at least keep what is left of their live stock. So the byzantine times have become alive again, with simple shepherds filling the scene of a movie like atmosphere in the midst of a surrounding so beautiful it’s hard to grasp while the sound of bombs shake the air. While the animals are still a little savior and luckily the old aqueducts continue to carry some water, these people too lack whatever else there is. The plastic sheets help cover some of the shelters, blankets and clothes protect from the cold. Wheat, rice and lentils delivered will cover some few days, if portioned in small rations. On the way to the families already on the delivery list we will find more families. More to add to the list the “hopeful smile” is trying to feed. When we return to our own hideout, we are greeted by the laughing chief cook, a man with a face of a boats captain. We crowd ourselves around a laptop that has made itself a path into the world wide web and discuss why this world is not reacting. In front of the oldest mosque of the city, just in the city center completely destroyed we find two public phones. The blasts that has his them has modernized them, they are now wireless and we joke while we try to call the UN. The news of the 50 million dollars for humanitarian aid that have now been decided on by the U.S. leaves everyone speechless, when we understand they have decided to deliver it to the people through the regime. This kind of news become terrifyingly gruesome when you go to visit the only make shift hospital in the city. When you think that meeting the first children of this city and learning that they all have infected themselves with hepatitis is bad news, well the hospital conditions we find just make them feel worse. İt is in a cellar and I have no clue if a public report should mention it’s location. İ don’t know how things go here, but when i know that all hospitals the city used to have were bombed, i feel the need this place not known. The creativity of the last five doctors and the rest of the medical staff has no borders. They have been able to retrieve some basic equipment from the destroyed hospitals and built wooden rooms in the cellar as operation stages. The hygienic surrounding is a disaster, as is that of electricity for light or heating that a place like this would need. A basic x-ray is possible, but that’s just about it. The doctor we are travelling with most of the times had just finished his studies and specialized on cardiology. Above the operation stage you will notice the professional kind of lamp setting needed to light the surgery. İt’s shape is just as it is in every operation room, but when they point us at it we understand they built it by themselves. İt is a big satellite disc, in which they have fixed halogen lamps. One bigger room is filled with patients. We are supposed to document, but I am too shy to point my camera at them. One is lying in bed like a shadow of life. He is completely paralyzed from top to bottom. He is so thin and so grey that it chokes whatever there is in me. He had surgery in Turkey, but as the care centers there are full he has been returned and now grows thinner and greyer day by day in this cellar, while the bombs around make the building rumble. We meet a patient whose toes were removed due to diabetes. There is no treatments left also for the sick or old, in a place where you men get their legs and arms cut off, due to the lack of any other medical choice. The people working here in these conditions are the heroes I can easily side with and claim as such. While we walk the streets again we receive a recount of the revolution and how things developed here since then. Back at the hide out center the stories told to us are underlined with the many videos and pictures collected throughout these last two years in exactly these streets. It was after the helicopters and the bombs they dropped on the people, that the first arms were taken up by the citizens of the city. They show us the locations Assads army used to hold: the museum filled with ancient mosaics for example, that this city is famous for. From here about 200 people were shot by snipers. ‘you want to die? Just visit the museum,” they used to say. “We had no chance than to defend ourselves” they say. 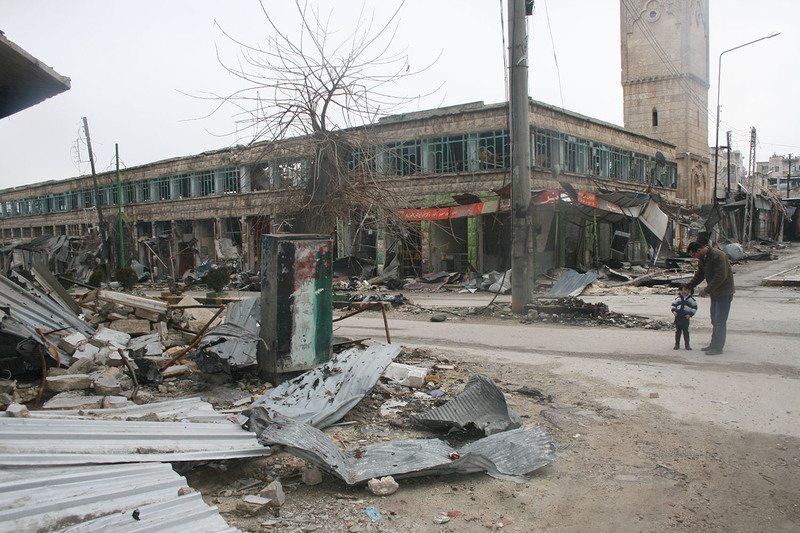 It took almost half a year and many dead in Maarat, before the armed resistance took its go. It has achieved a lot: nobody is being shot from the museum any more. This part of the city is free. People are desperate to prove their peaceful intent. Again and again they demand us seeing the videos, where we can see the proof: the same buildings, the same streets and the people being killed within. There is no way around the facts, this is how it happened. The question where the weapons of the resistance came from in the first place and who delivered them with which intent is another. But the understanding why people decided to take them is easily fulfilled. Then of course there is weapons and logistics from the West and various groups with religious narrative. We meet the fighters of the Free Syrian Army. Of course we meet them. They sit at the sides of the road and come to greet us on our ways. They are grandfathers, fathers and sons. They are cousins and uncles. They too are students, or workers, or shop owners, or teachers or engineers. At least within this city. They are the ordinary citizens of Maarat. They too are very upset about the image of them being some sort of Al Qaida. “Where is Al Qaida?” they ask. Joking they add that maybe Al Qaida could actually help them out with the fight at the front only two kilometers away. They explain us how the ethnic divisions are systematically produced. They know about villages of poor Alewites, first besieged and starved, then pressed into fighting on the side of the regime. A big amount of the free soldiers we meet have been police or soldiers in Assads forces themselves. They know how terrifyingly difficult it can be to defect. They tell us that it’s not even the soldiers in that army they consider as their enemy. But the reality of this fighting knows no pity. They tell us that as well. And they know that the media reproduces these fears and divisions. They fear that the ethnic and religious war will become the truth, when only the powers push long enough for it. They fear this imposed on them, more than they fear death itself. And the way they move and talk and act I strongly believe them: they have lost the fear of death. Religion and belief surely is part of gaining this strength. But the fear of their society becoming one they never wanted is still alive. I have come here and I am moving around as a single woman also in the nights that have become the streets of men. It is these men who easily are produced to a picture of the extreme and hateful. I did decide to wear a veil in these days to not make things more complicated and as we have no experience anyhow in how things can develop in these circumstances. We too were frightened before entering. And it was not just the bombs we were frightened of. It was also the fierceful image of militias we see as the image of Syria nowadays. But even though my veil keeps sliding off, as I have no practice in tying it, even though i smoke, talk and move as a woman in a conservative surrounding here wouldn’t I receive respect and protection in all the days and places we travel. On our ways to the city and to the villages we see other faces of fighters than from the city. More grim behind some weapons, more strict in the look, more controlling. The fighters from Jabbah al Nusra who freed Taftanaz Airbase surely are not the chatty kind of guys we can easily become friends with. They obviously did an amazing job: seeing the huge space and tens of now burnt helicopters they freed is impressive. From this place the wrath of the regime was brought upon the Syrian people. But we feel this wrath has been returned. What happened to those injured or captured and the many bodies of the dead of the Assad army is a question nobody we dare to ask can answer. We discuss the intentions of religious groups coming to fight in Syria. People don’t deny, also the men we get to know from FSA don’t deny that there is those who come with a vision of there own. That there is those who are criminal and low in moral. People tell us how they are struggling to set up courts to trial those who use the power their guns give them wrongly. İt becomes obvious that things are a mess. A very big and a very sad mess. But this mess is a mix more complex than a division between the good and the bad. The secular or the religious. The peaceful or the violent. Even if the vision of some of the very religious is not shared by all, this does not mean that all the very religious fighters are low in moral, are acting with crimes against the people or are trying to impose their visions. İt is a whole mess of a people fighting to save themselves and others, of trying to keep up the ideas and demands of a revolution, keeping up the popular committees while drowning in the isolation the world has set upon them and the interfering interests of states and secret services, of groups intending to import sharia, all of them acting through the channels of support and neglect, money, weapons or aid. But all of the wrong in the territories freed by the FSA does not make right what is on Assads side. 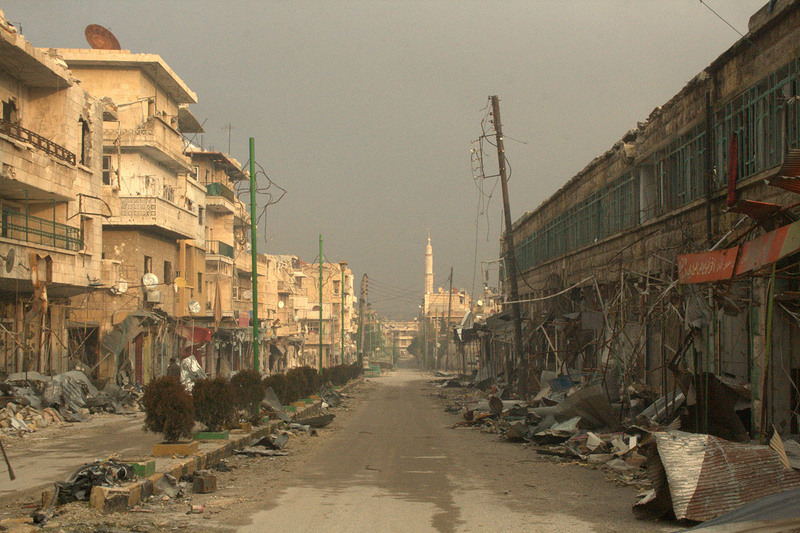 The paths to solidarity with the Syrian people have become quite stumbly. It is hard to find them and also not when you want to find. While we move around we have to question every story we hear again and again, we learn to look at it from all sides and have still understood much too little and much too much. It is very obvious that the things happening here are a big heap of a crime, committed by many. But these have many colors, and they many seem to agree in one thing: that they all have the need to instrumentalize the crumbling of the Syrian society for the benefit of theirs. The only reason this is happening and all parties are participating in doing the best possible actions and inactions leading to this total chaos, is the power struggles in which each part thinks they can win their strategies, when only the Syrian society has at last lost its’ soul. As a European citizen I feel my main objective in demanding our governments to play a role in breaking the isolation people are trapped in, at least on the level of making humanitarian aid possible. People we are talking to are very aware of foreign intervention and they don’t wish it. But as the world acts as if it weren’t happening, the mess here is a whole collection of foreign intervention already. Only that it solely seems to be the ugly side of it reaching and not that of simple aid. The activists on the ground are having to fill this gap, their political struggle for freedom and equality is being pushed aside while they are pressed to do what aid agencies should do in a much bigger scale. The starvation of the people and massive displacement is the fertile ground for corruption and violence to have its’ go, while the societies popular movements are systematically destructed. The complete refusal of our governments, or the International Community to launch their capacities for aid can only mean that there is a great interest in this society breaking and extremist forces taking over. As an anti-imperialist I feel my main objective in tossing the debate of the traditional left into a new analysis and this very fast, as our traditional debate has already lost track of the fast developments in the area. In my opinion the useless try of our voices being heard and our positions being set within the debate of siding or opposing whole states strategies as such have always been wrong. İn the case of Syria they are more wrong than ever. There can be no romanticized position next to a regime, just because this regime opposes some of the other regimes or states we also oppose. Assads regime is not the anti-capitalist, anti-imperialist secular dream, or the partner of a humanitarian libertarian left. And many of the rebels on the other side are obviously not as well. But for now they are not an entity or have the power of a state. For now they are the direct result of a people being slaughtered and starved. If we live up to our so called ideologies of freedom, equality and justice we must continue –no we must at last start to walk in Syria, we must be creative and loving in the solidarity we have to offer, we must not let the sole aid be that of liberals or extremists, we must not let the people drown into dependence on partners that are none. At the moment it is not the right to determine political aims of ours within Syria, at the moment people just need support to survive. They are very well capable of keeping up their society of differences, of creating a free and equal Syria for all, if we only meet face to face with them and give the isolation and stigmatization they are confronted with a united blow.